Chicken Karahi is a dish that originated in Northern part of Indian subcontinent. Cooked in a wok called Karahi with freshly ground spices, and fresh green capsicum, Chicken Karahi is a regular item in most hotels that serve Indian cuisine. I always wanted to recreate the chicken karahi served in the hotels. Happy to report that after a few iterations I now have a recipe which I can claim as nearly perfect. So, here’s my version of the Karahi Chicken that is served in Indian hotels. Roast all the ingredients listed under 'To Roast and Grind' until fragrant and grind them. Boil and puree the tomatoes. Heat oil in a Karahi and add bay leaves, cloves, black cardamom an saute for a few seconds. Add grated onion and ginger garlic paste and fry till the onions become soft and raw smell goes away. Tip in the balance roasted and ground masala, add a bit of water and fry it well. Add tomato puree and fry till all the water is evaporated and oil separates from the masala. Add the chicken pieces and fry it with the masala for about 5 minutes. Add some water and cook till chicken is tender. The gravy should be thick. Taste for salt, and sprinkle the garam masala powder. In a very small karahi or a utensil of your choice, heat 1/2 Tsp oil and add ground chilli powder. Switch off the gas when the chilli powder sizzles. Pour the sizzling mixture of oil and red chilli powder over the cooked chicken. 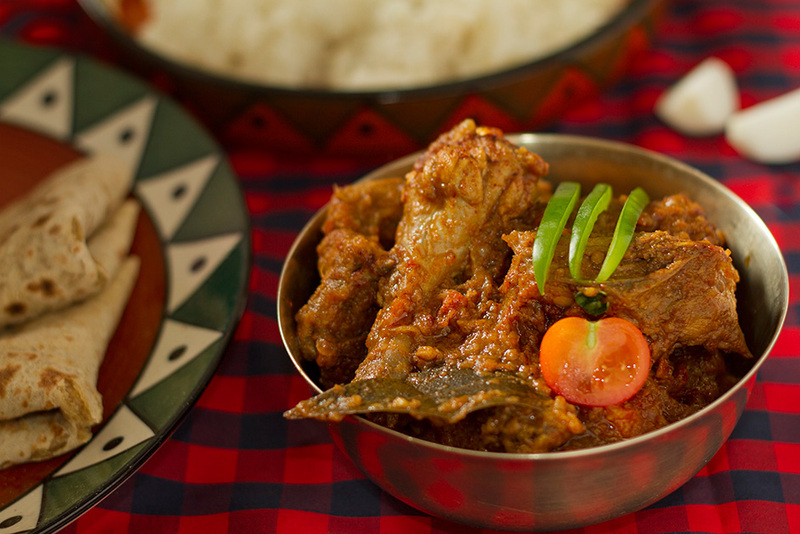 Serve this delicious Karahi Chicken with hot Indian flat bread or zeera rice. A karahi (/kəˈraɪ/; Hindi: कड़ाही kaṛāhī, Urdu: کڑاہی‎; also kadai, korai, karai, kadhi, kadahi, kadhai or cheena chatti) is a type of thick, circular, and deep cooking-pot (similar in shape to a wok) used in Indian, Pakistani, Bangladeshi and Nepalese cuisine. Traditionally made out of cast iron, karahi look like woks with steeper sides. Today they can be made of stainless steel, copper, and non-stick surfaces, both round and flat-bottomed. Stews prepared in a karahi include chicken karahi, beef karahi, mutton karahi (often also made with goat meat) and dumba karahi (made with lamb meat) and also karahi paneer (a vegetarian version). Prepared in a reduced tomato and green-chilli base, a karahi is a popular late-night meal in Pakistani cuisine, usually ordered by the kilogram and consumed with naan. A Balti, based on the food of Baltistan, is another dish cooked in a karahi. An inverted karahi is used to cook Rumali Rotis. I’ve got to try this! Looks so good!